A while ago, April 1 to be exact, I had a very vivid dream, which by itself is quite strange because I generally don’t remember my dreams at all, and I just had to write it down, especially since I can still remember it like it happened yesterday. In the dream, I was in Brooks Brothers shopping for a suit of armor. I had on some chain mail, and one “tailor” (I hesitate to call him that) was measuring me for a breastplate, while another person brought over a cart, not unlike the dessert cart at an upscale restaurant, showing me the different styles and types of metal available for it, as well as some gauntlets and helms that might match the different styles of breastplates. I picked out a shiny gold accented number, and the second guy suggested the accessories that would go best with it, which I accepted. He then whisked the cart away after writing down my selections and telling me what great taste I had. The “tailor” continued to measure me. A few moments later a young woman brought over some cheese and crackers and asked if I wanted any coffee. That’s the end of the dream. I assume, from the gold accents, that I was getting a new formal suit, but I don’t know if there was a specific occasion. According to the Dream Dictionary, wearing armor might symbolize my defense mechanisms and shielding myself from those who want to hurt me. In addition, I might be trying to protect myself from unconscious material or sexual desires. The problem is that I was not really wearing the armor, although the chain mail could be a type of armor. Since I was buying a new suit, perhaps it means that I was getting ready should I need to bring up my defense mechanisms against sexual desires? 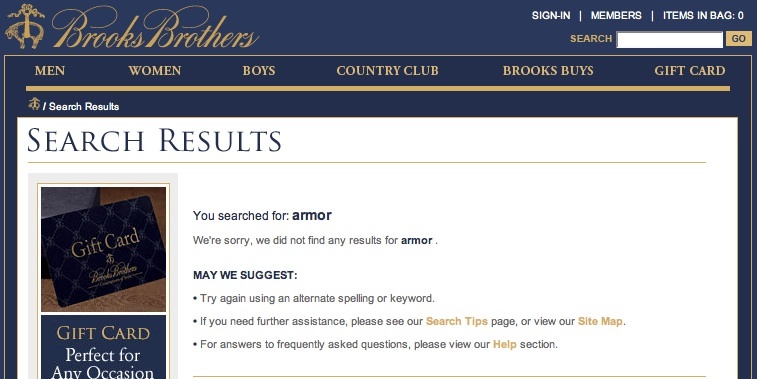 I just checked out Brooks Brothers web site, and they do not seem to sell armor.